WARNING! You are doing all the modifications described in this document on your own risk. I am not responsible for any damage to your printer or Raspberry Pi. High voltages are involved in this setup, so please do not start the modifications if you are not sure what you are doing! As soon as my Prusa i3 MK2 was built from kit, I’ve decided to automate it a little bit using a Raspberry Pi (RPi). RPi was mounted in a 3D printed case from Thingiverse ( https://www.thingiverse.com/thing:2325272 ). This is fixed on the back of the frame, in the upper left corner, using 2 x M3 screws. The upper part was modified to allow the access to the GPIO connector. 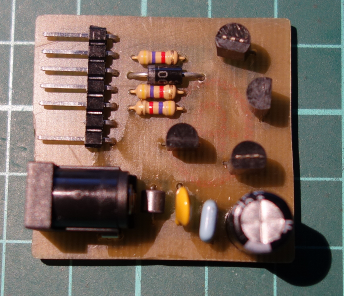 The original 5V/2.5A Raspberry Pi power supply was used. 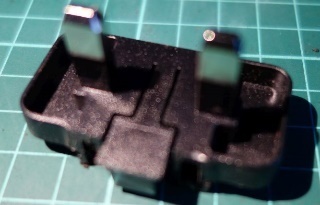 The power connector is modular, with adapters for different standards. 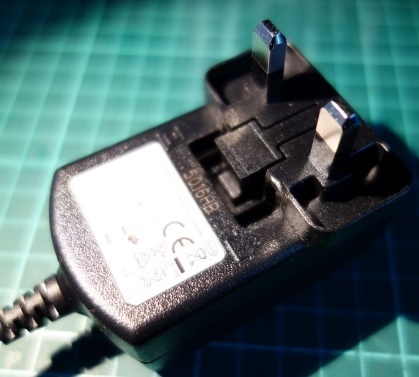 The UK adapter was cut using a Dremel as in the following pictures. 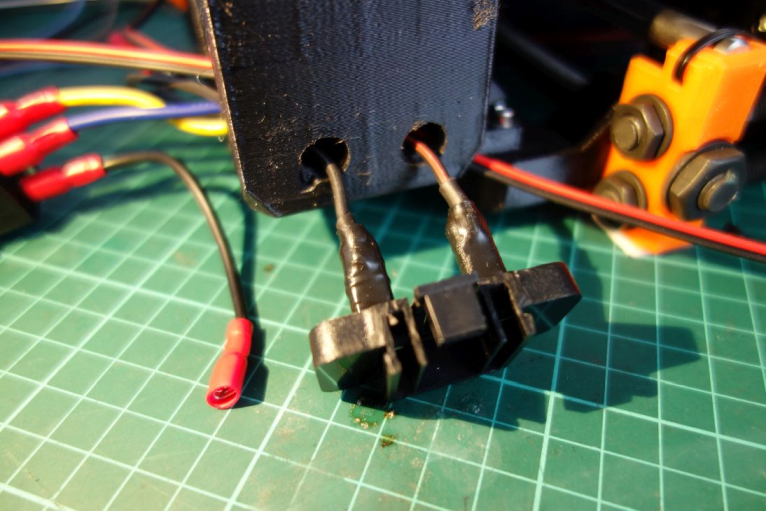 Glue the two 3D printed fillers to the power adapter. 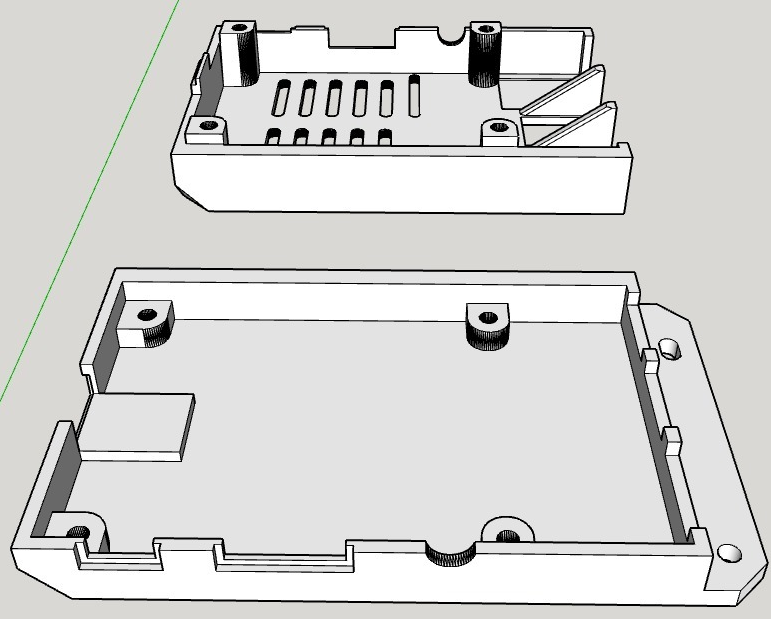 Two pieces of isolated wires will be soldered to the RPi PSU power adapter pins and then to the printer power connector. 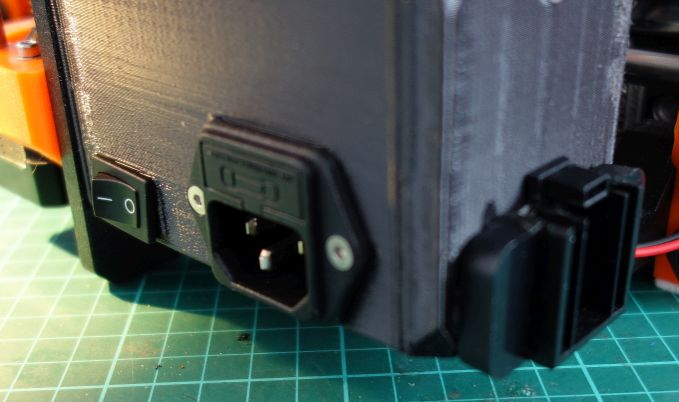 Use the 3D printed template to make 2 x 6 mm holes in the back of the black ABS box where the power switch and connector are placed. 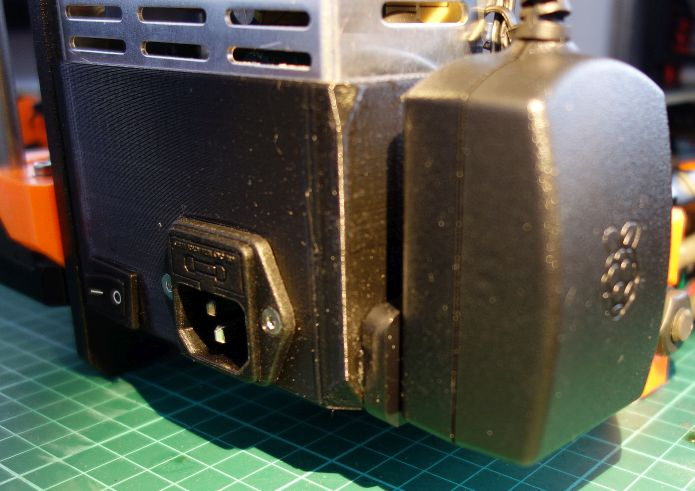 The RPi PSU must be permanently connected to the mains, no matter the position of the printer power switch. A bifilar piece of wire (~ 1m in lenght) will be soldered to the relay coil and then routed to the control module (described later). 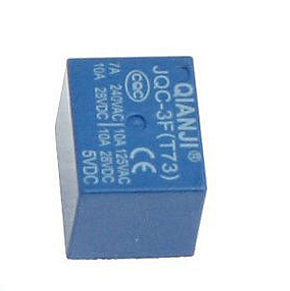 You can use any miniature relay with a 5V coil and able to swith 220V/3A. 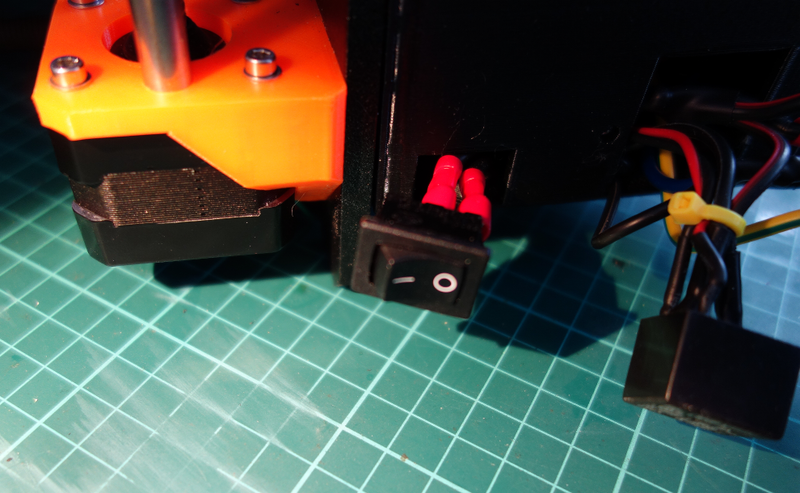 The relay will be inserted in the same black ABS box under the printer PSU. When ready, slide the RPi PSU to the power connector. You will obtain at the end a clean look in the printer power supply area. 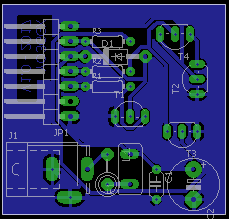 The 5V cable from the RPi PSU will be routed to the control module (described in next chapter). 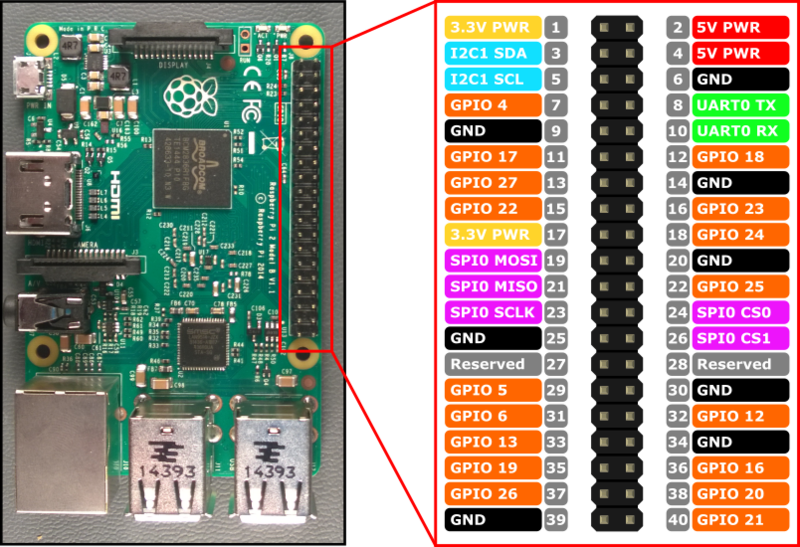 The control module will use two GPIO pins from RPi to control printer power (GPIO18) and light (GPIO23). The light will be automatically switched off when the printer is off. The schematic is presented in the following picture. This is the bill of materials for this module. 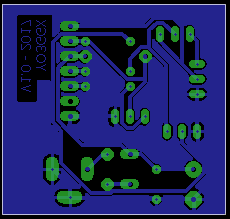 The PCB (single side) is presented in the following pictures. Eagle files are available by request. 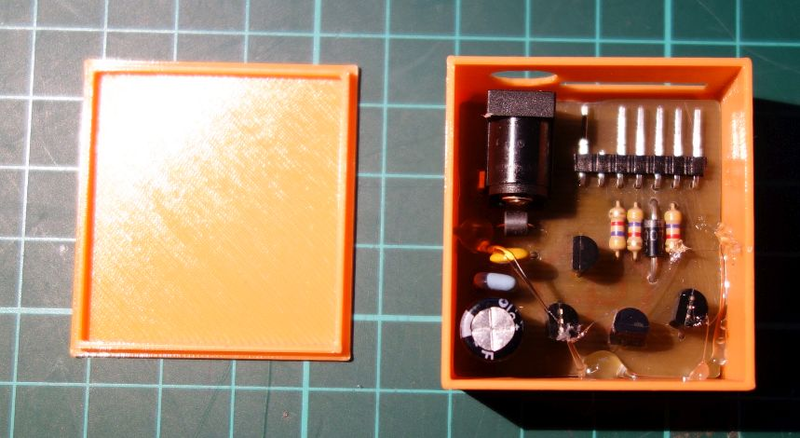 The PCB is mounted in a 3D printed case. 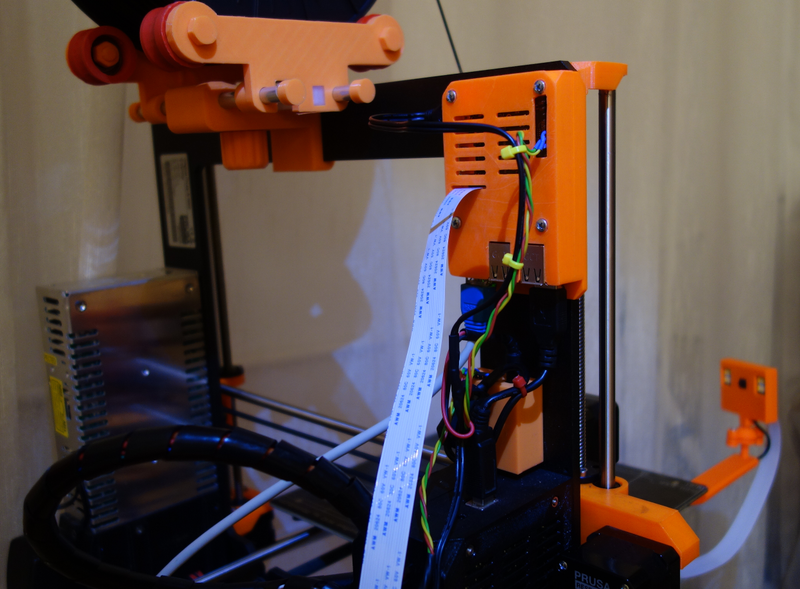 Stick the case to the back of the printer frame (below the RPi) using double sided adhesive tape. 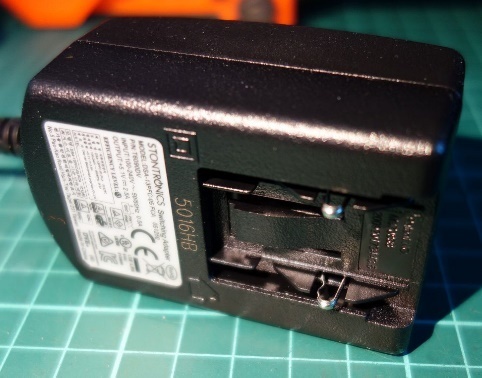 The RPi PSU 5V cable will be cut ~ 10cm from the microUSB connector and a 10cm of bifilar cable will be soldered with the DC power jack at the other end (used to power the control module). A short cable will link one 7-pin female header (JP1 from the schematic above) to one 8-pin female header (pins 2-16 from the RPi GPIO connector). The 2 wires from the relay will be connected to JP1 pin 5 (+5V) and pin 6 (RELAY). 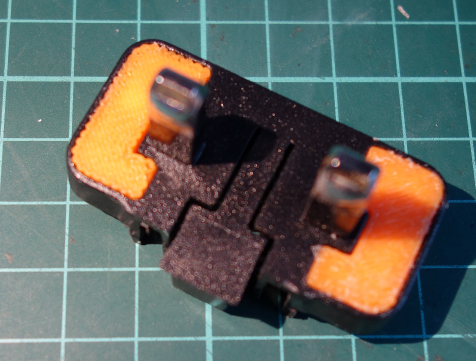 The two wires from the 5V LED light will be connected to JP1 pin 7 (LIGHT) and JP1 pin 1 (GND). 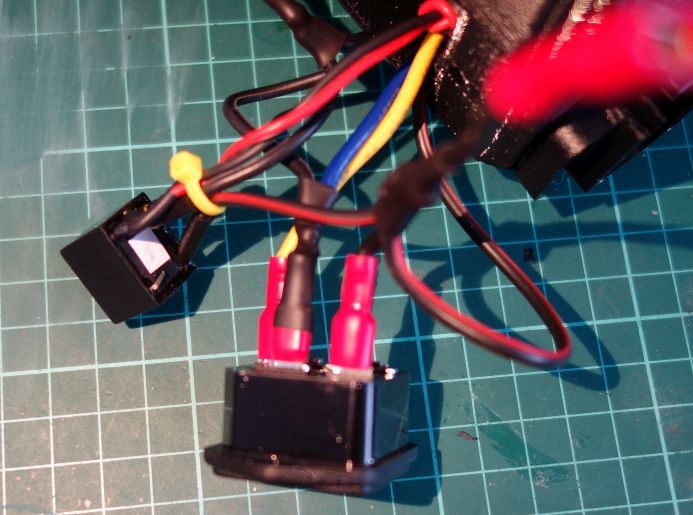 I’ve used a thin (3mm) coaxial cable to connect the LED light to the control module connector (+ for the central and GND for the braid). Considering the fact that the camera and the LED light are fixed to the printer bed, the cable to the LED light is routed together with the bed cables (heater and thermistor). This is how it looks with the RPi and control module fixed on the back of the printer frame. 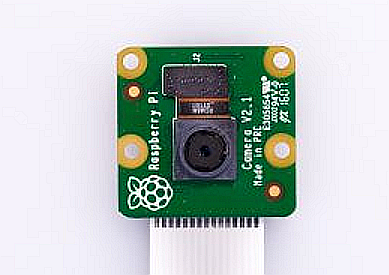 A Raspberry Pi camera (V2.1 – 8MP) was used for this project. Camera is connected to the RPi using a 1m flat cable, that can be ordered from here: (http://www.ebay.co.uk/itm/122640624047 ). NOTE: Do not use longer cable to prevent unreliable camera connection. A shorter cable (60cm) will not be long enough for our purpose. 1m is just right. You will need a fast and reliable microSD card (Class 10 as a minimum) to install the operating system and OctoPrint application. A 16GB or greater card is recommended as you will store some time-lapse video capture files (maybe even in 4K). and write it to the SD card using Etcher. 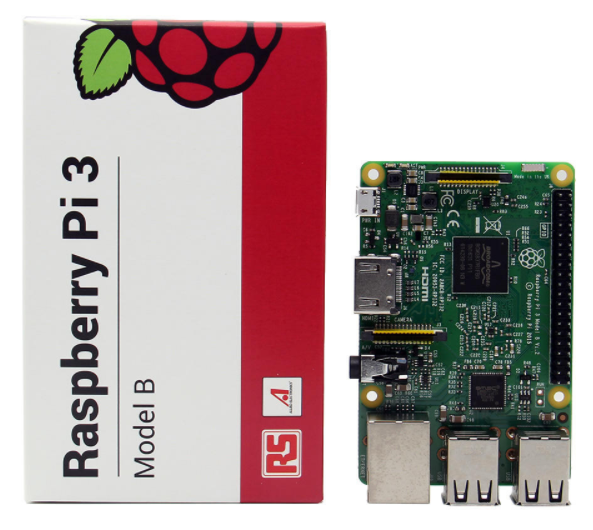 For further steps I recommend you to connect a HDMI monitor and a USB keyboard to the Pi and a network cable to your router for Internet access. RPi will be restarted. Run the terminal and then enter the following command. In bold are the commands you send, the answer from the server is the rest. Note the reported IP address. You will use it later to connect remotely through SSH or VNCviewer. You will be prompted with the following menu. First thing to do is to change the user password. If you want to make available the printer over the Internet, use a long and difficult to guess password. Use the “Interfacing Option” sub menu to activate the camera, SSH and VNC (can be useful later for management). From the “Advanced Options” sub menu expand the filesystem, then exit the tool and restart the system. 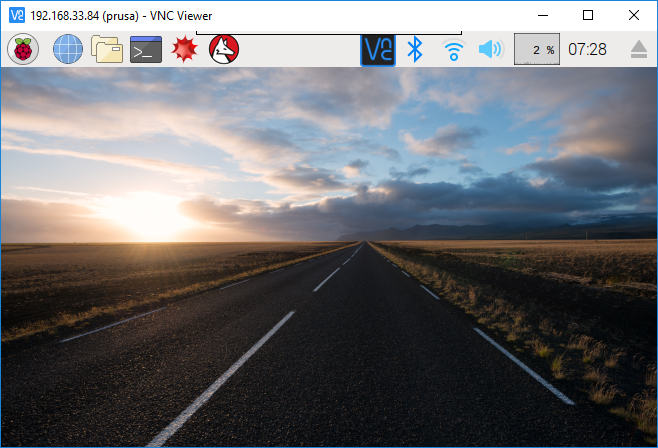 Run VNCviewer on a PC connected to the same network. You will get the following interface. Now you can configure the wireless interface and (optional) set static IP addresses. Left click on the Wi-Fi symbol and select the wireless network you want to connect to. You will be prompted to enter the password for that network. Enter the password and click OK. You will be connected to that wireless network. You will have two interface: LAN (named enxb….) and Wi-Fi (wlan0). Here you can configure static IP addresses if you want. and note the ip address for the wlan0 interface. 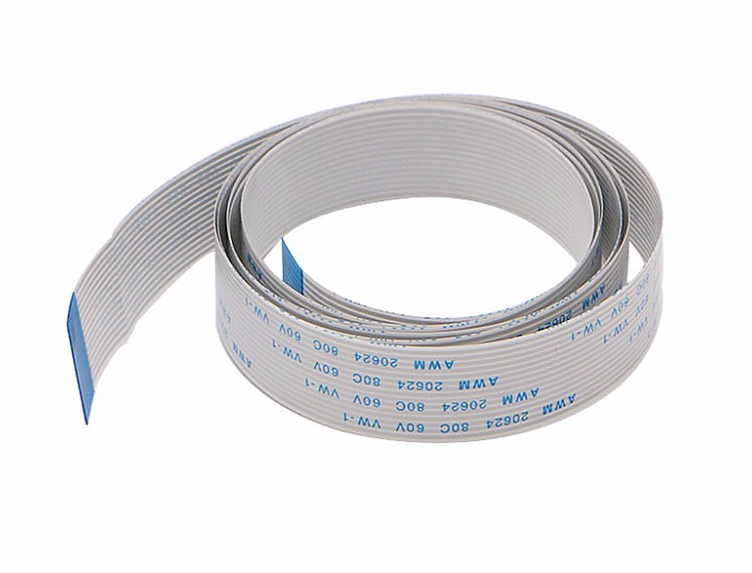 This can be used later to connect to the printer over Wi-Fi. Edit the “events” section as below. 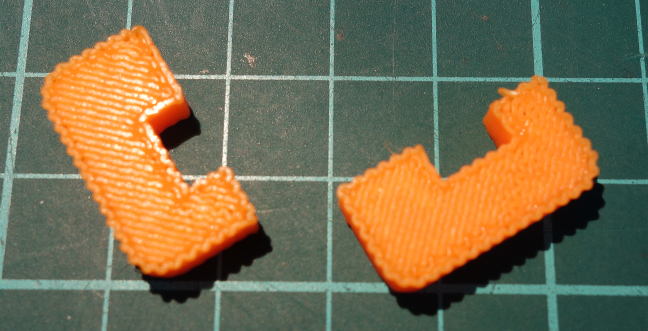 In order to prevent a bed mesh leveling calibration when the printer connects over USB, remove the G28 line from the ‘command’ subsection. 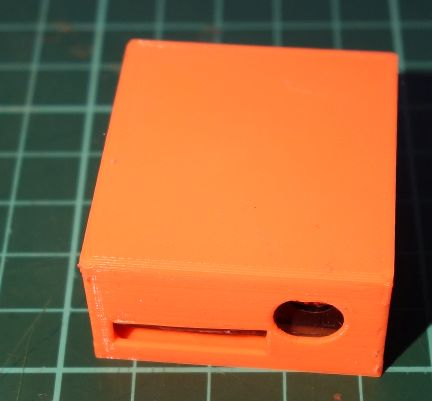 Without this modification, if the print nozzle is not clear, the connection will fail because the nozzle is still cold and the printer will push the “dirty” nozzle to the bed. 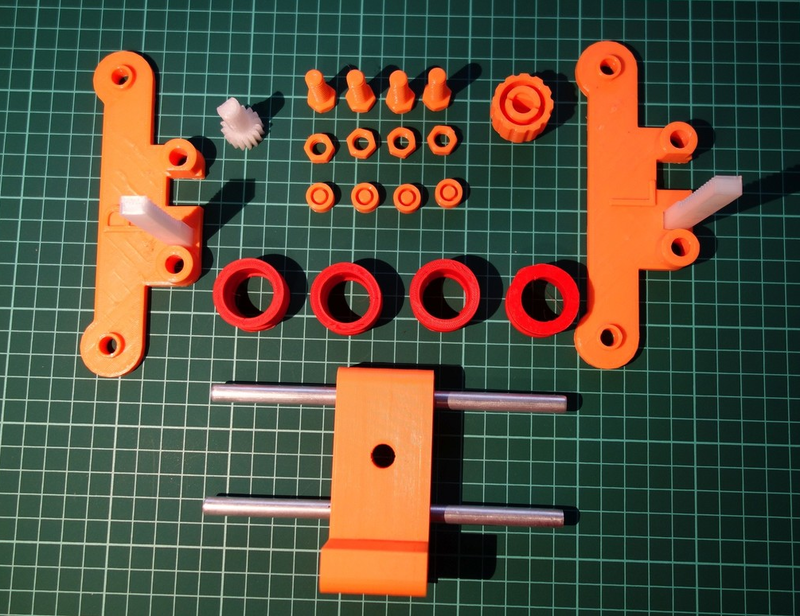 This will automatically start the light when print starts (if you forgot to start it manually). This section will add some direct commands in the OctoPrint menu. In the /etc/rc.local file add the following two lines before ‘exit 0’ line, in order to automatically set the GPIO 4 and 1 as outputs during boot. The printer is now ready to be used with the new features. For any question related to this project please write me a mail.